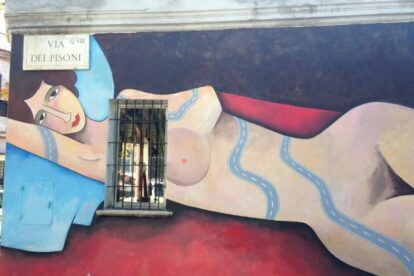 Another area where you can find great street art in Rome is Quadraro Vecchio (Old Quadraro neighborhood), a village-ish neighborhood between Via Tuscolana and Via Casilina made up of spontaneous small houses and decadent villas from the beginning of the 20th century. In 2010 this neighborhood began a makeover that is mostly street art driven, thanks to the guys at M.U.Ro. the urban art museum of Rome. Wandering through this neighborhood, you can admire artworks by Jim Avignon, Ron English, Zelda Bomba and Beau Stanton, as well as many other local street artists such as Lucamaleonte, Alice and Nicola Alessandrini. They all gathered together to create street art, which interacts with Quadraro people, a contemporary art collection totally integrated with the social fabric. Which is the best success you can hope for from street art! A couple of works are inspired by the partisan past of Quadraro neighborhood, which is something that today’s inhabitants are still proud of.